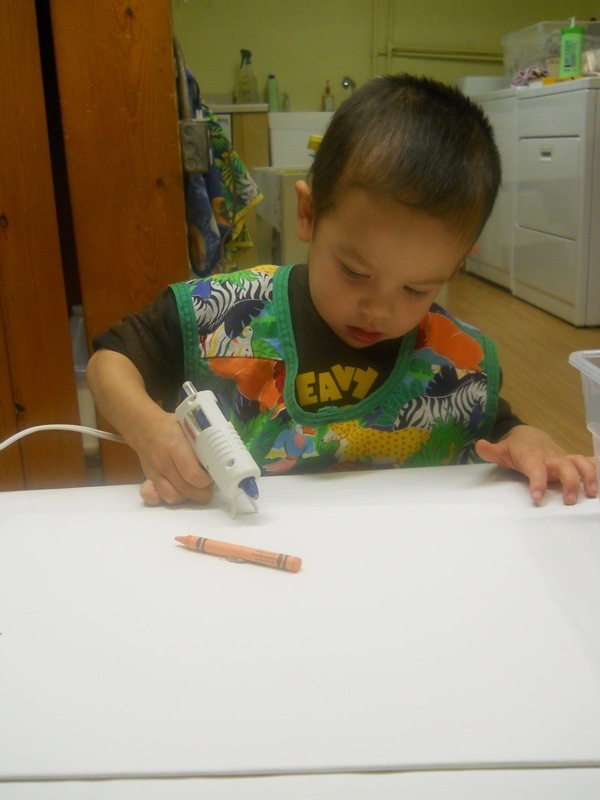 This a great project parents can do at home with their kids. 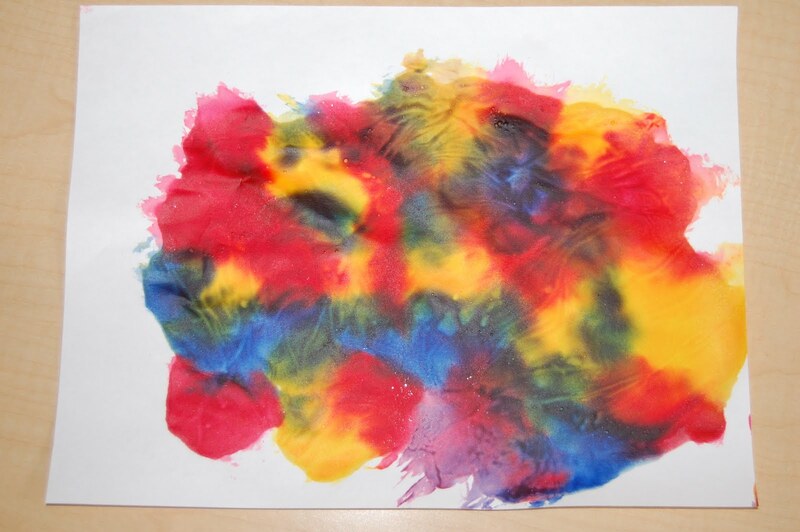 Color one cup of table salt with one tablespoon of liquid watercolor. 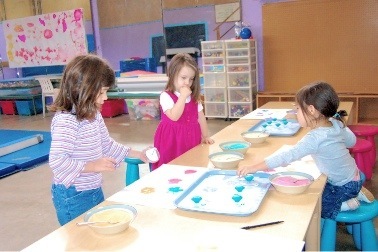 Let it dry on a tray overnight and then transfer it to a bowl. 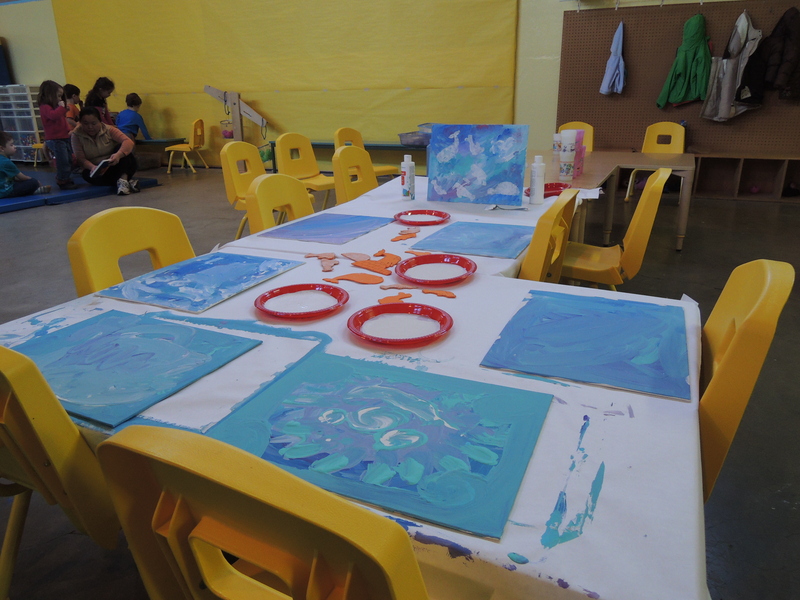 We used tropical colors for our project at school. 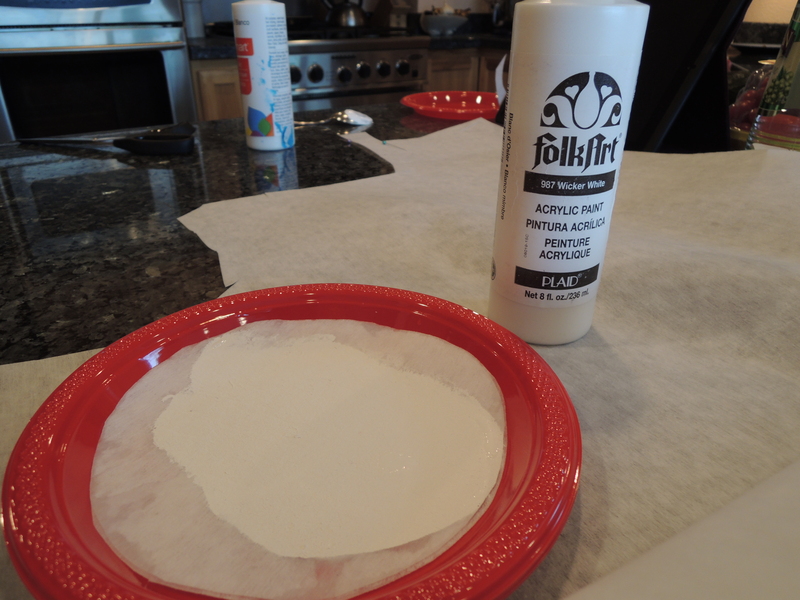 Spread a thin layer of white glue mixed with a little water onto the tray. 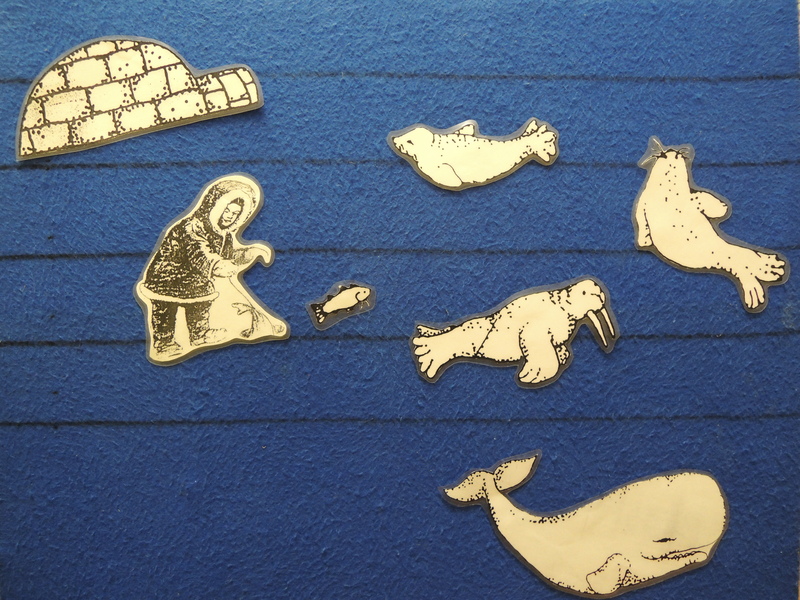 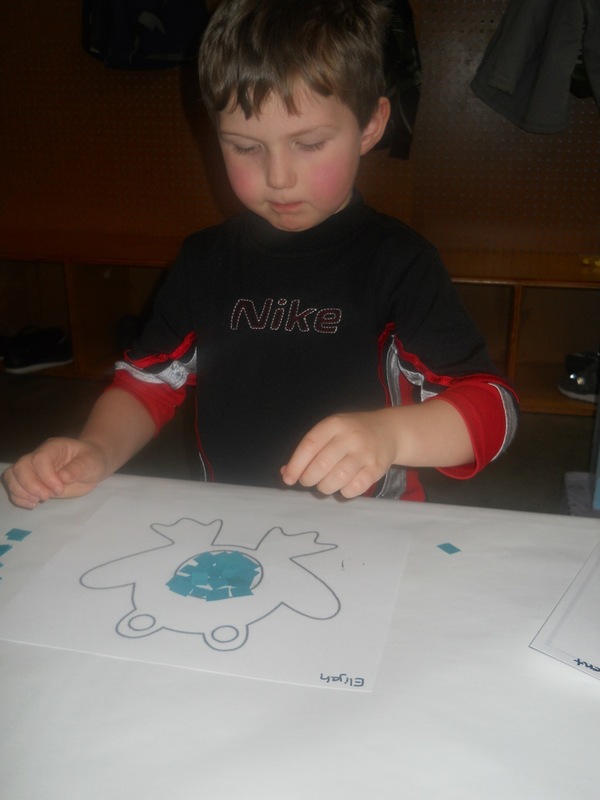 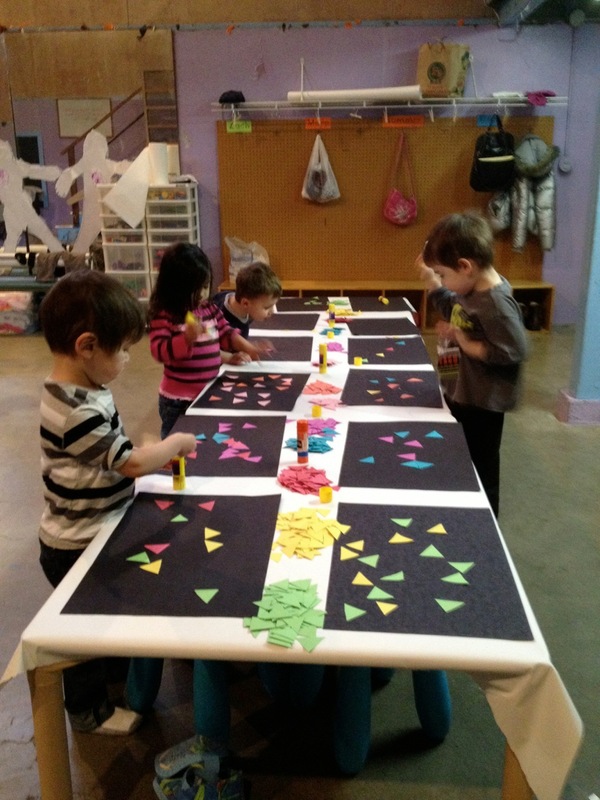 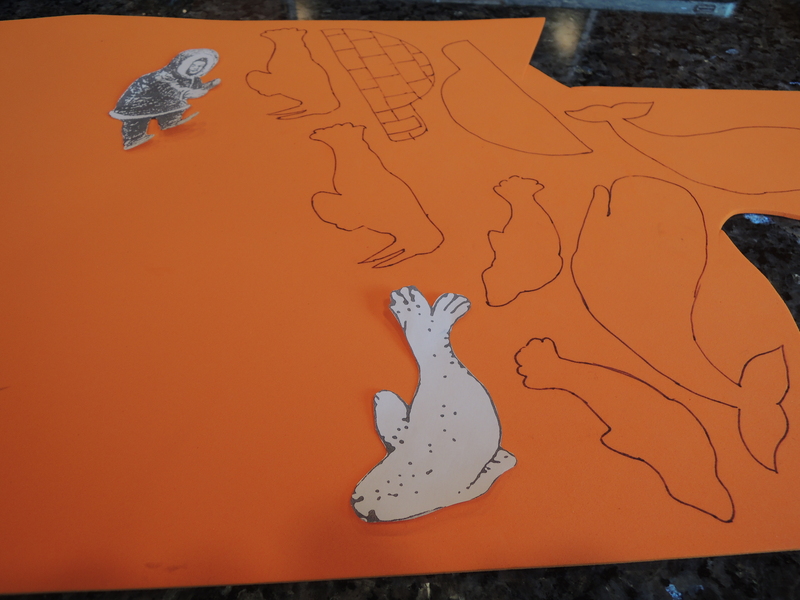 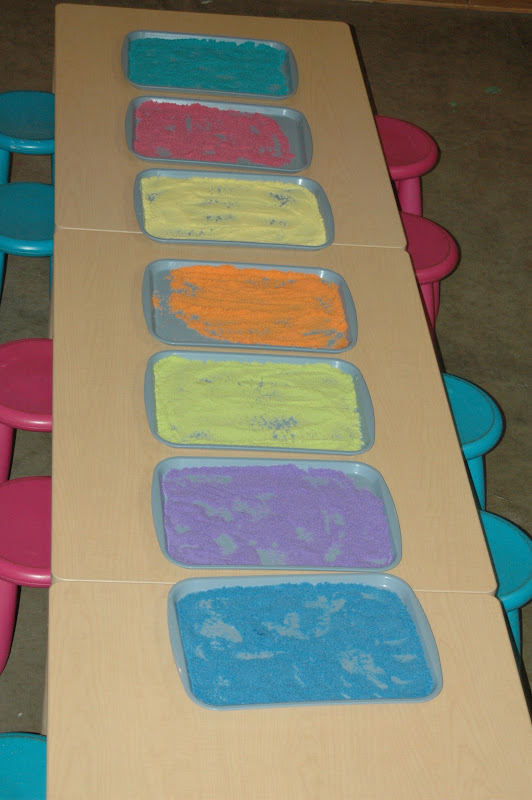 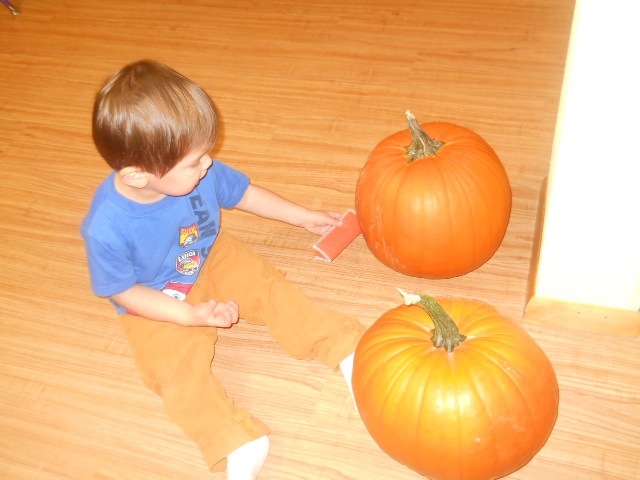 Let the kids stamp on construction paper and then sprinkle the colored salt over the glue. 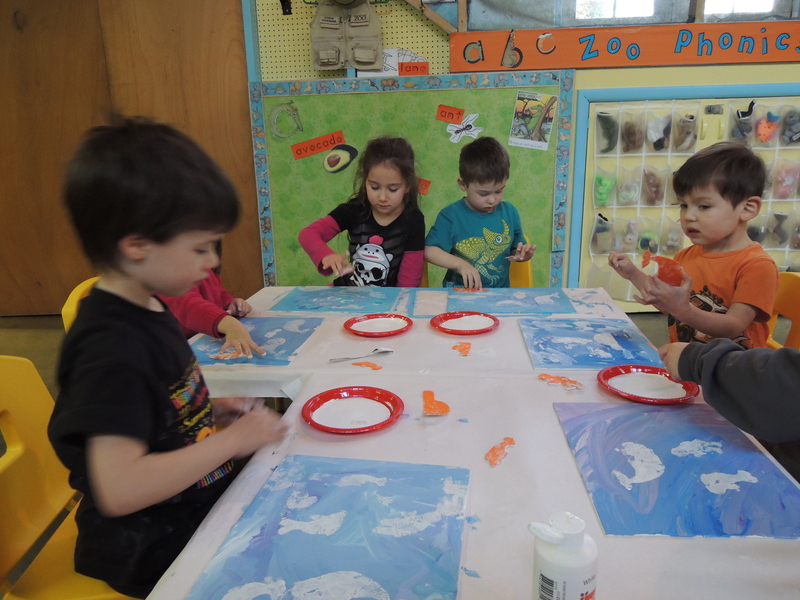 We used ocean animal stamps to go with our tropical colors. 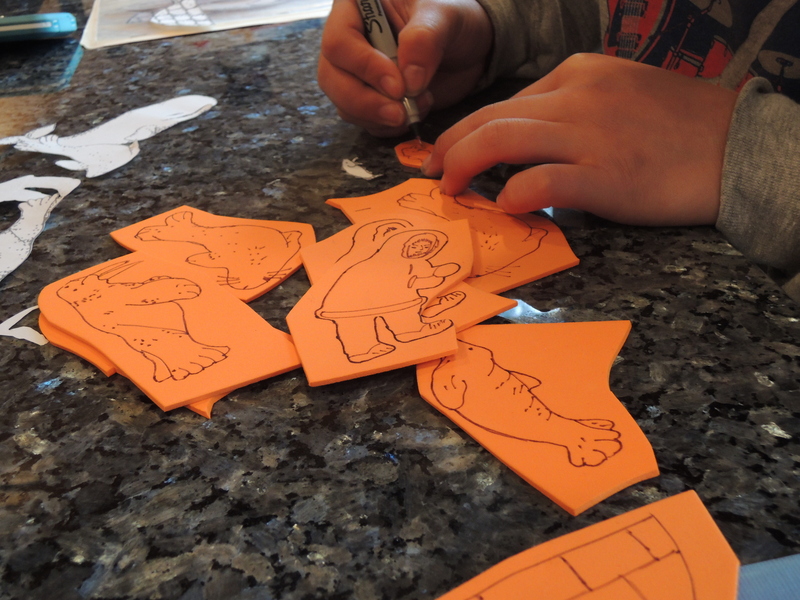 The kids loved this project, and it’s great for reinforcing the Chinese vocabulary they’re learning. 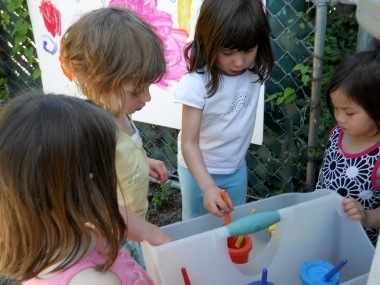 The weather has been very hot during the last two days and we’ve finally been able to begin our summer activities. This week the children painted murals on the white board. It’s great fun to see the bright colors and then mix them to make more. 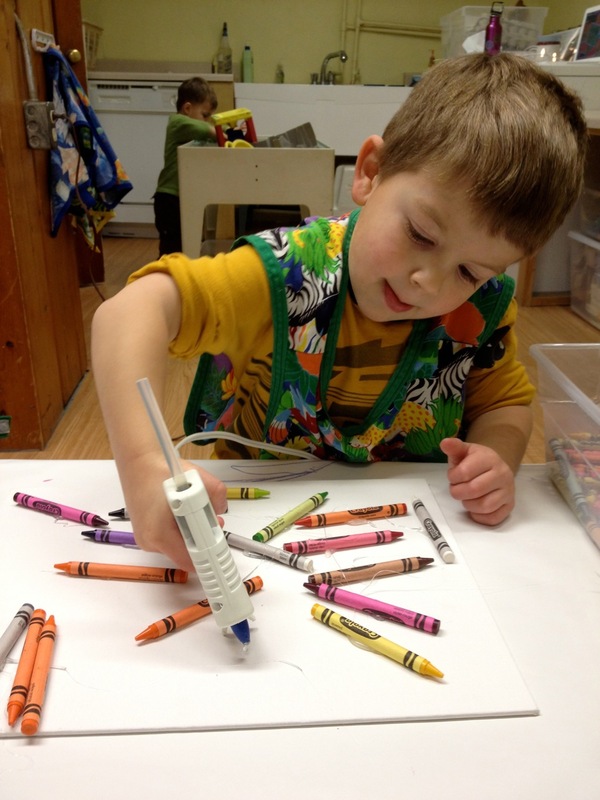 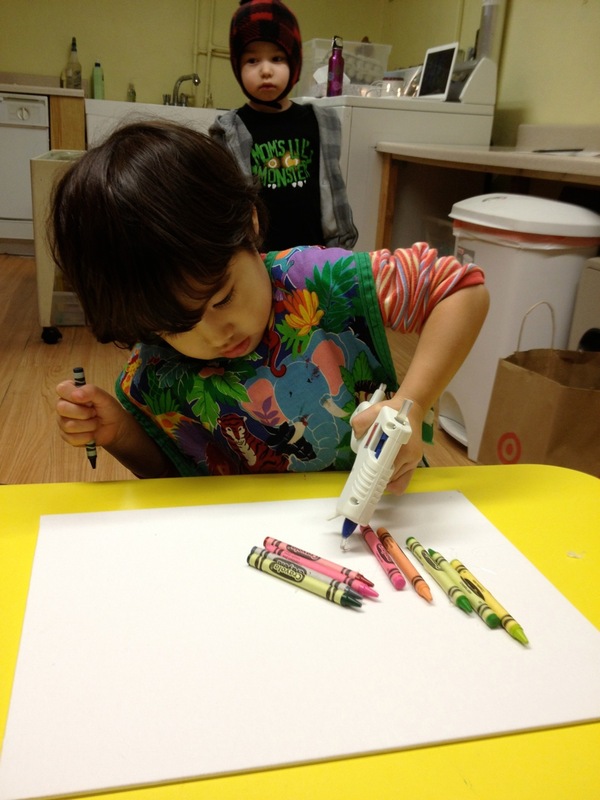 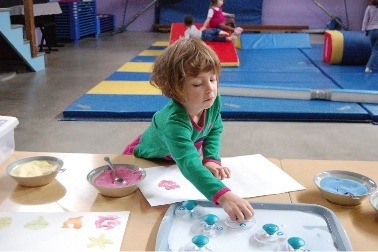 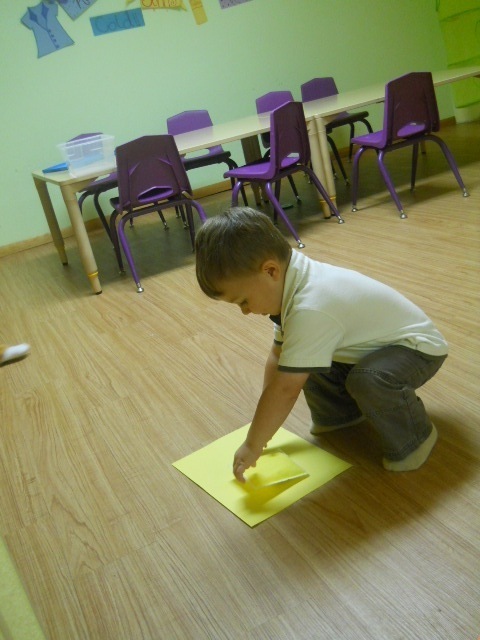 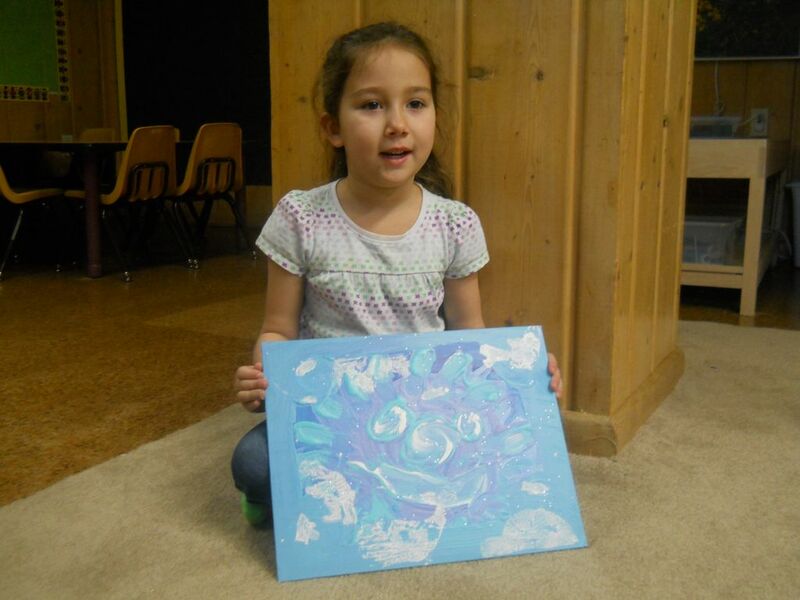 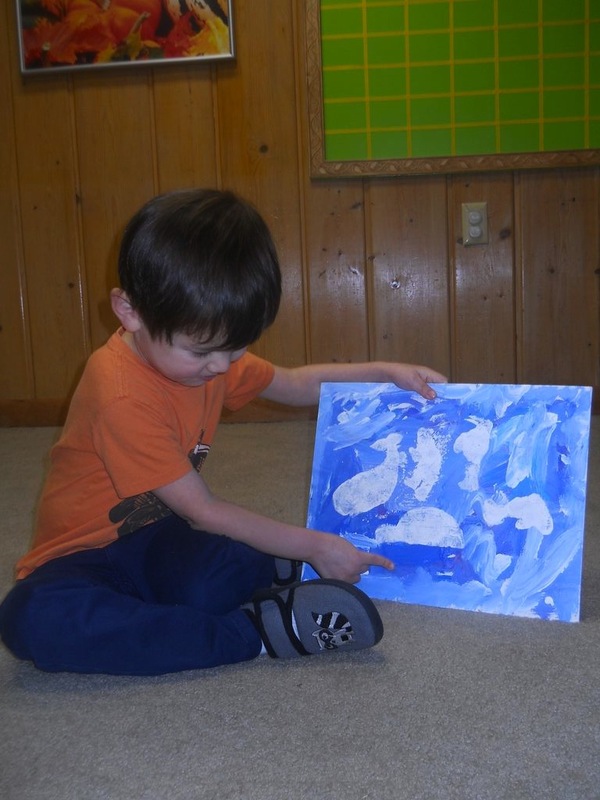 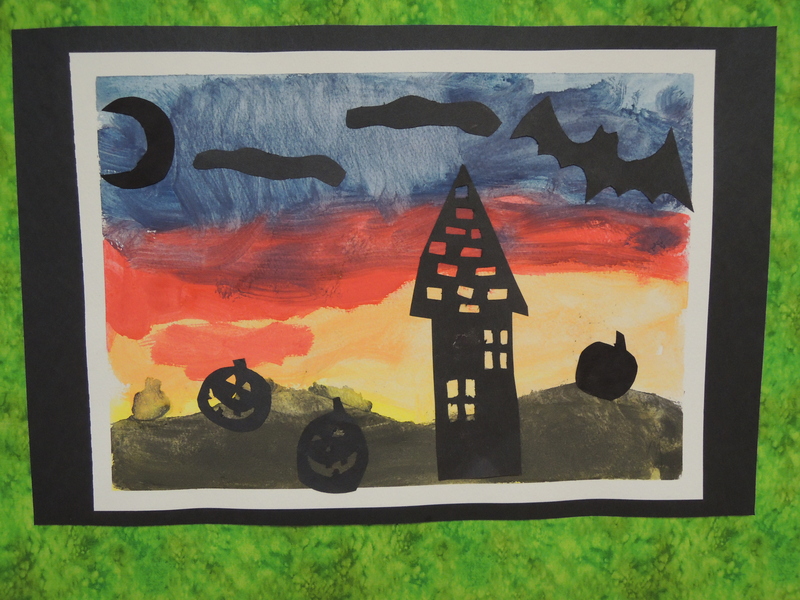 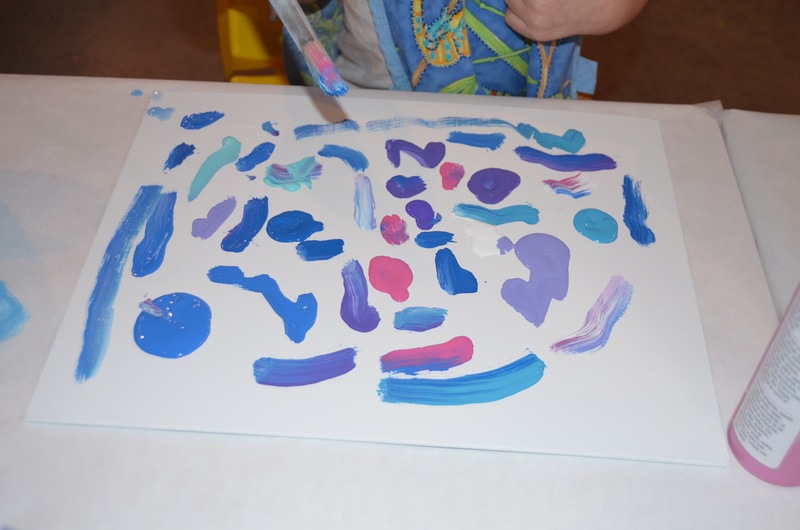 Before hosing the white board off children can take a piece of white construction paper to make a print of their painting. 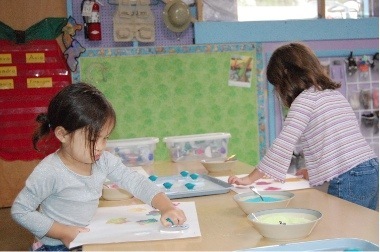 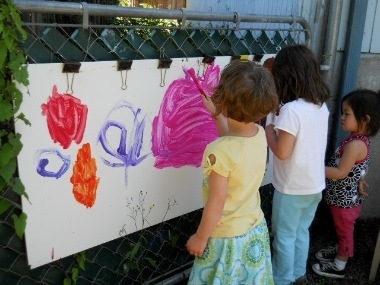 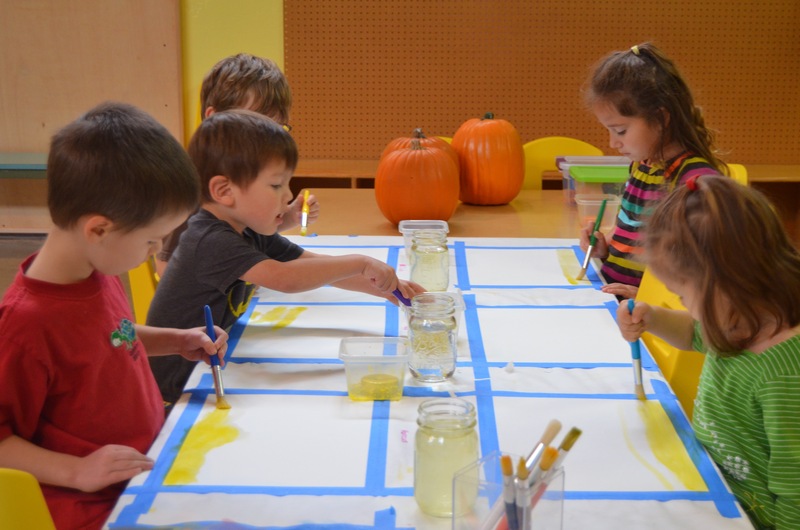 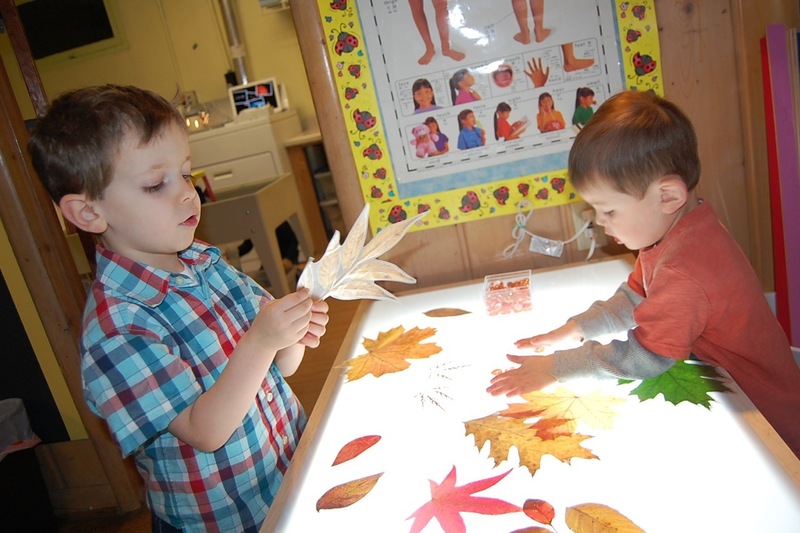 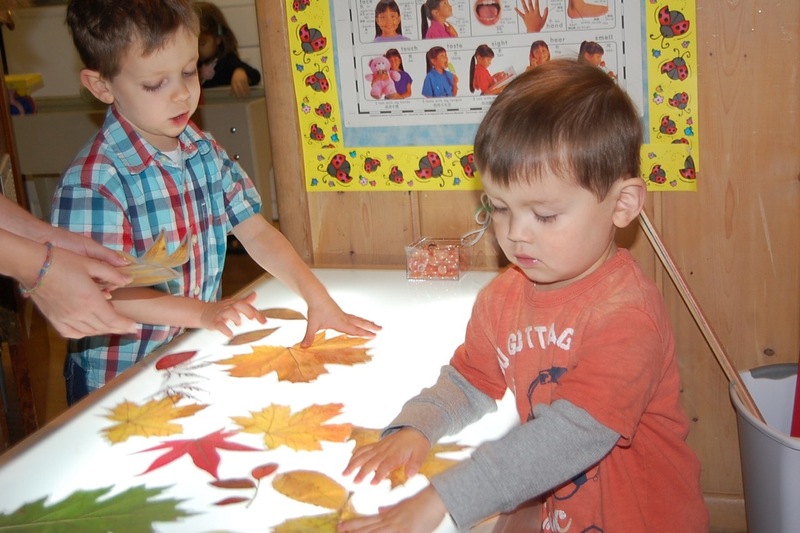 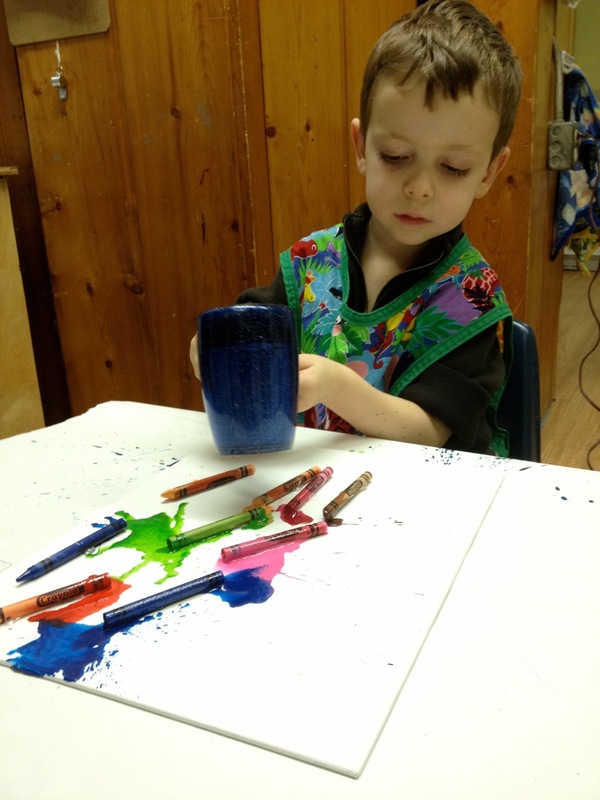 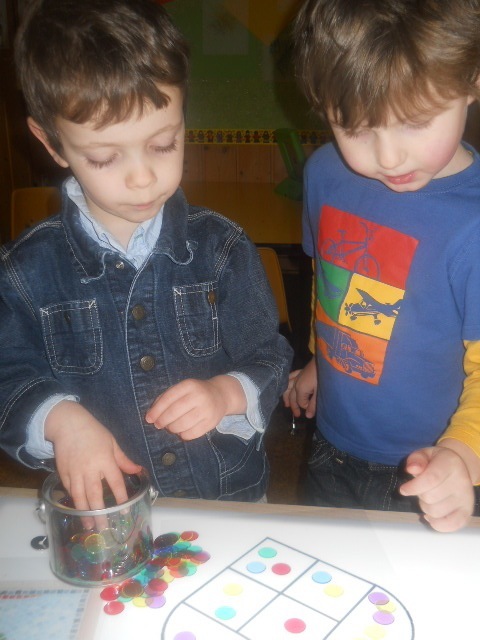 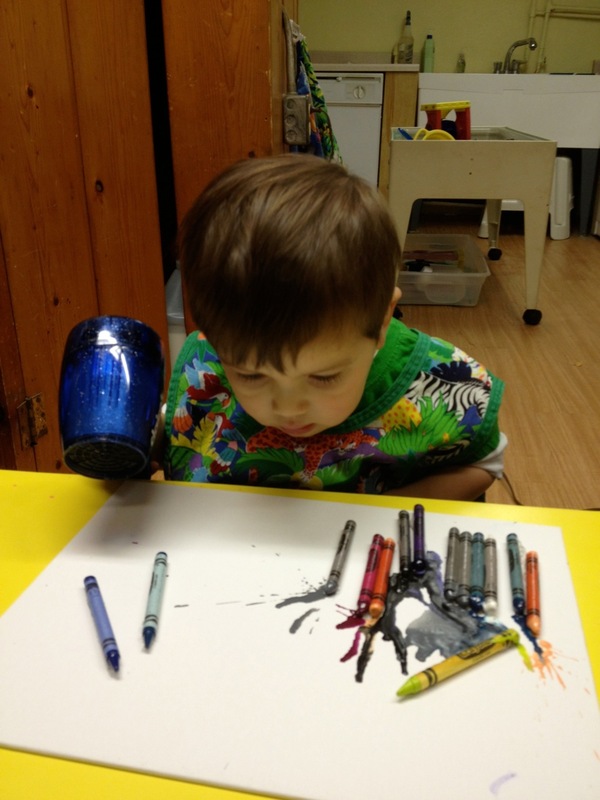 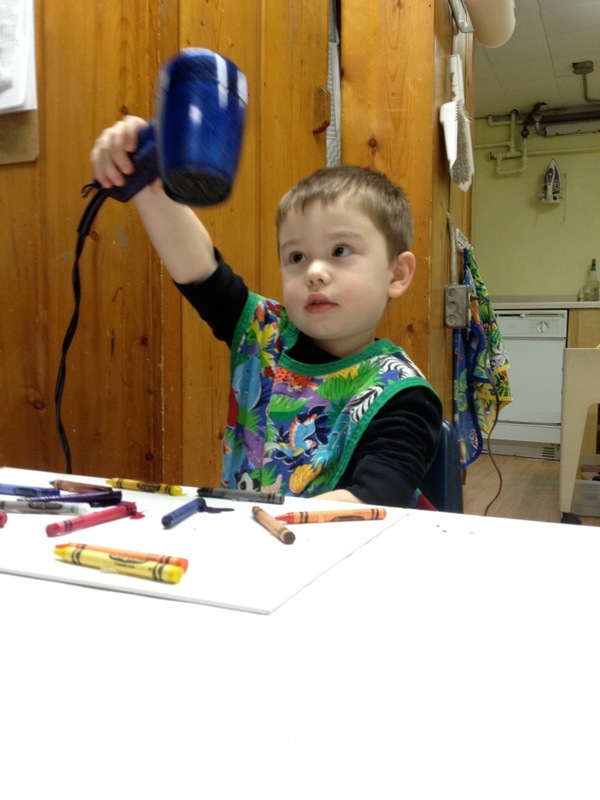 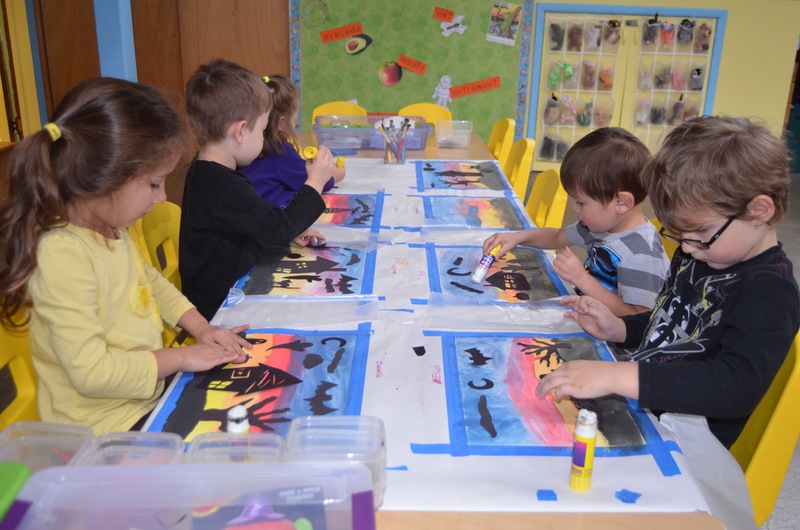 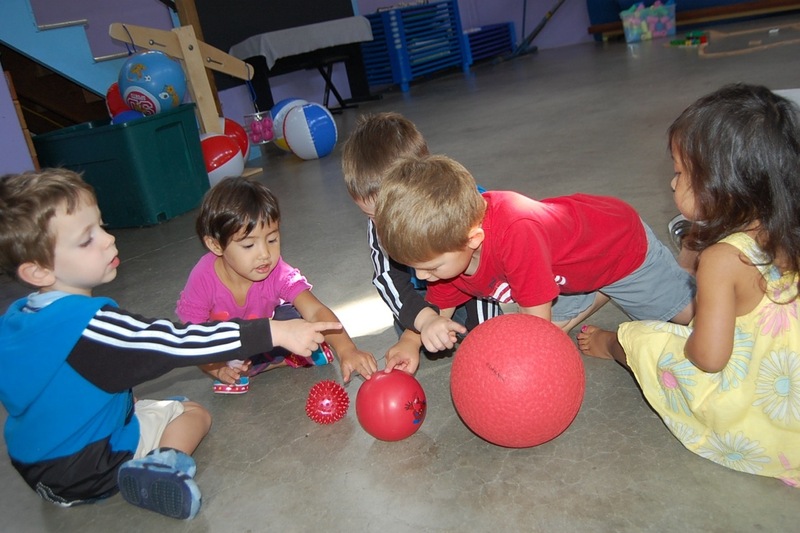 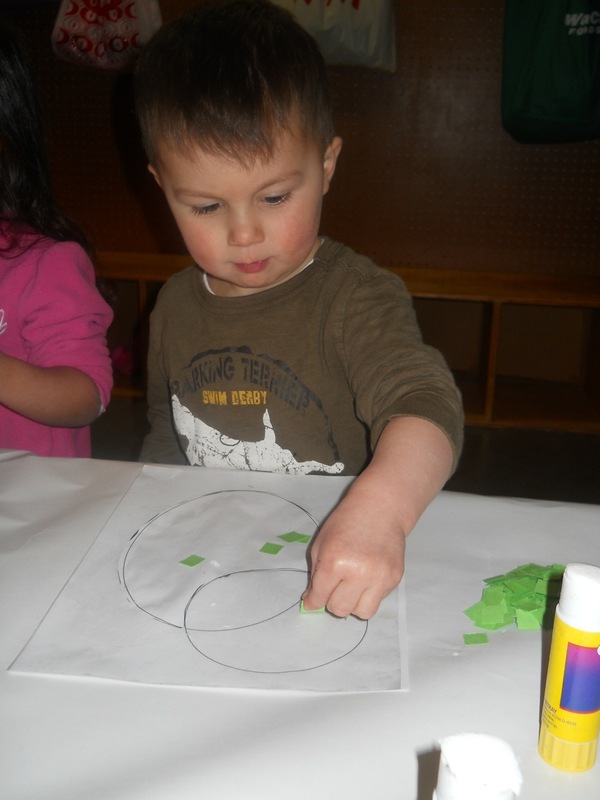 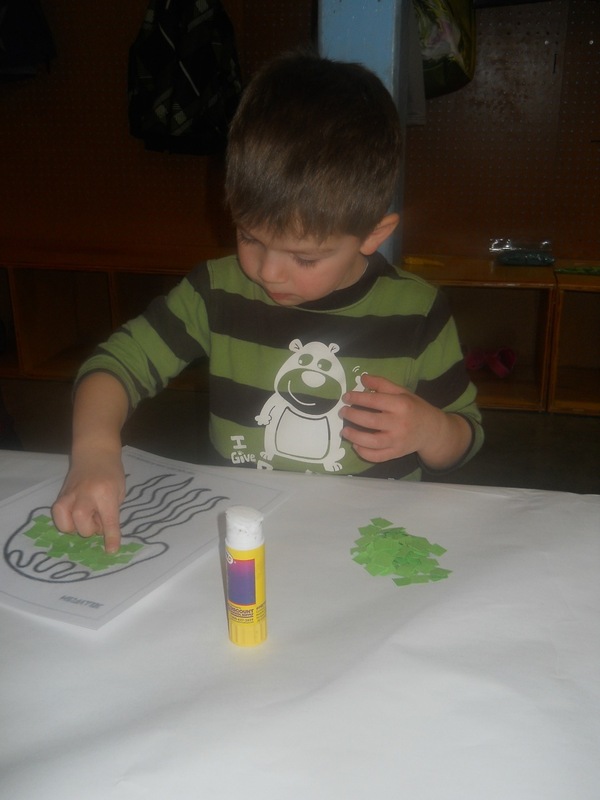 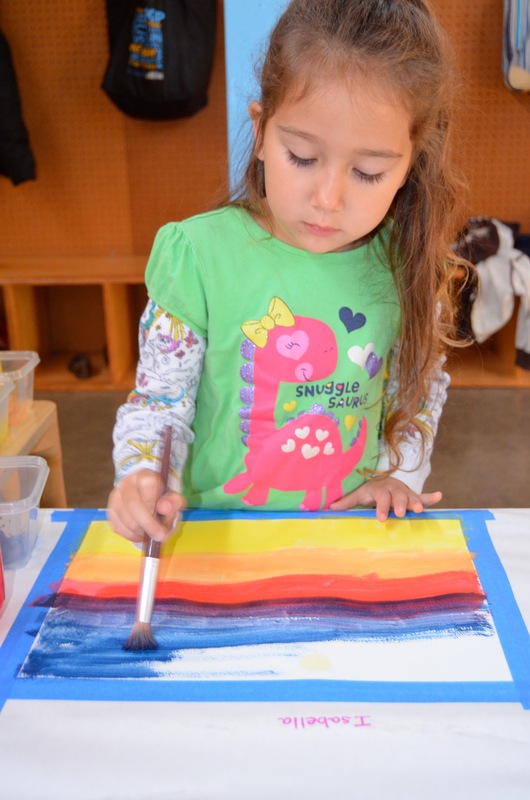 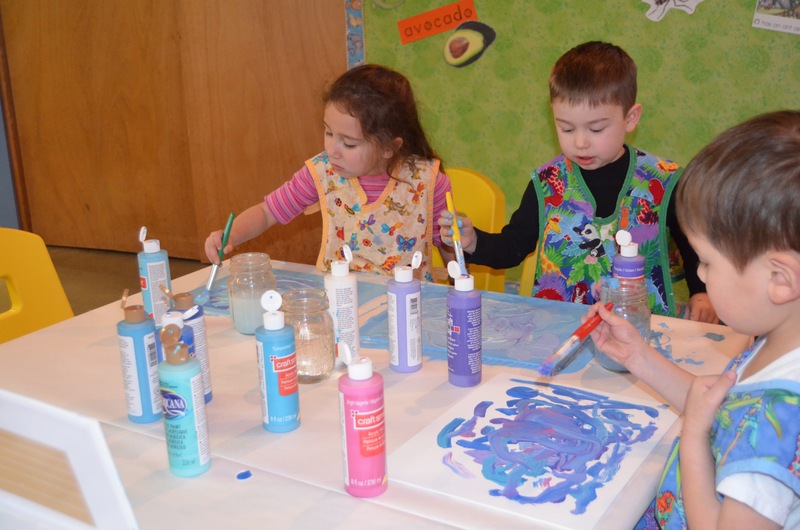 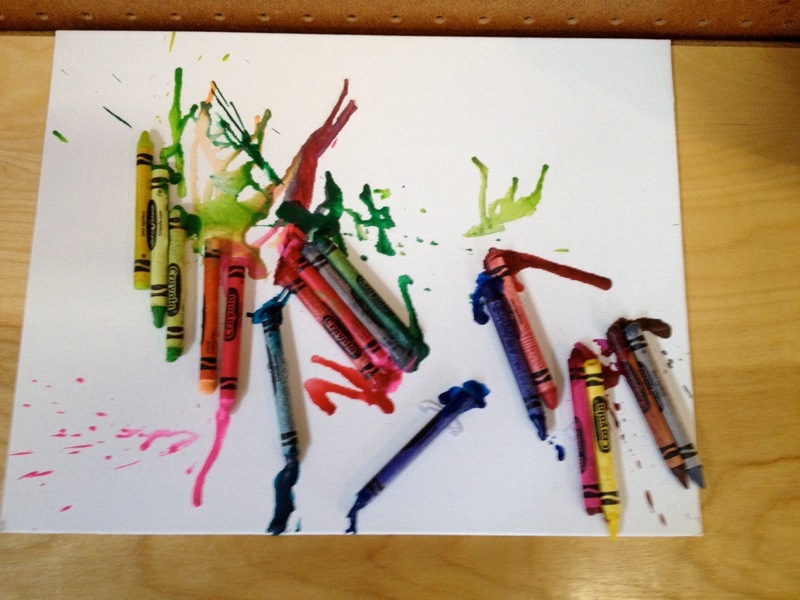 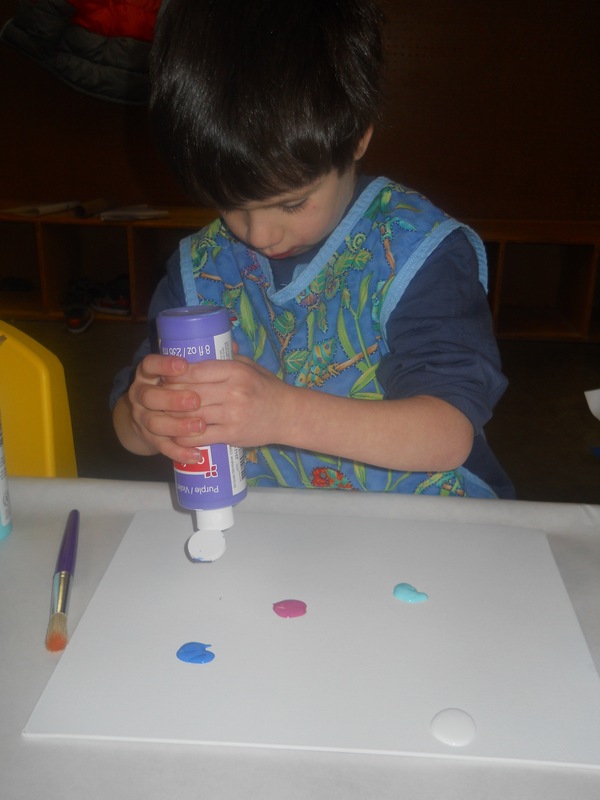 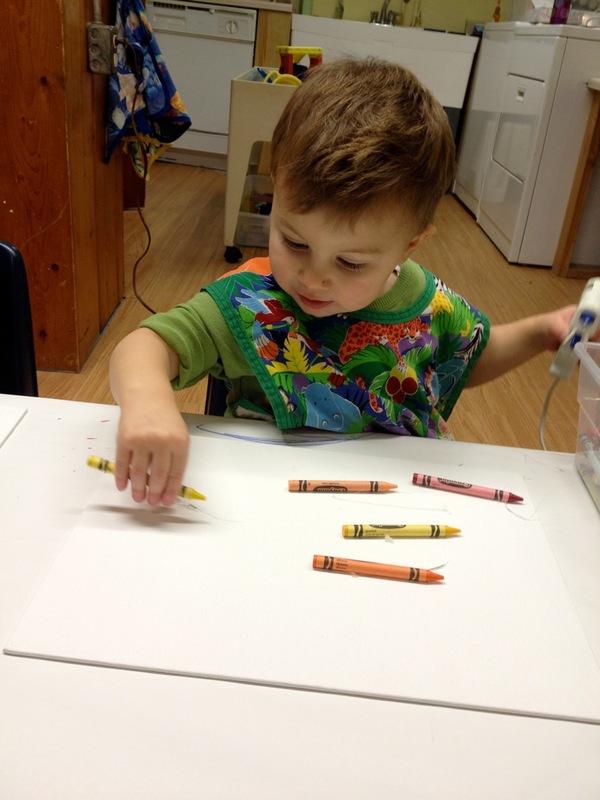 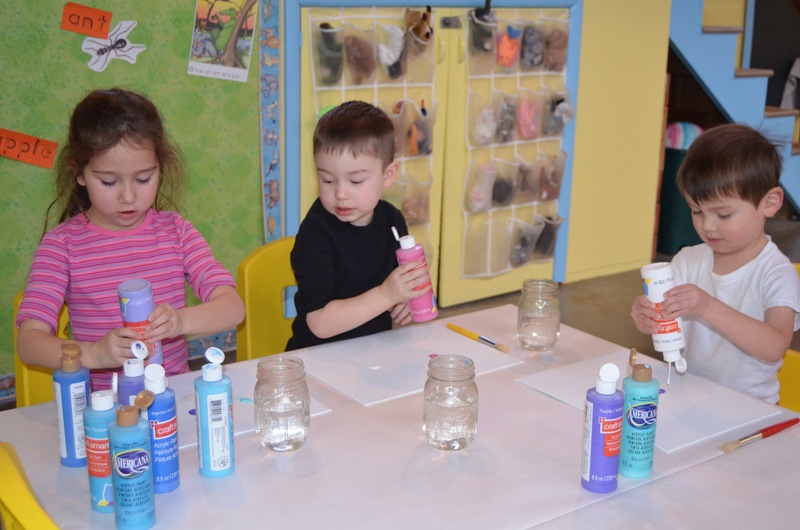 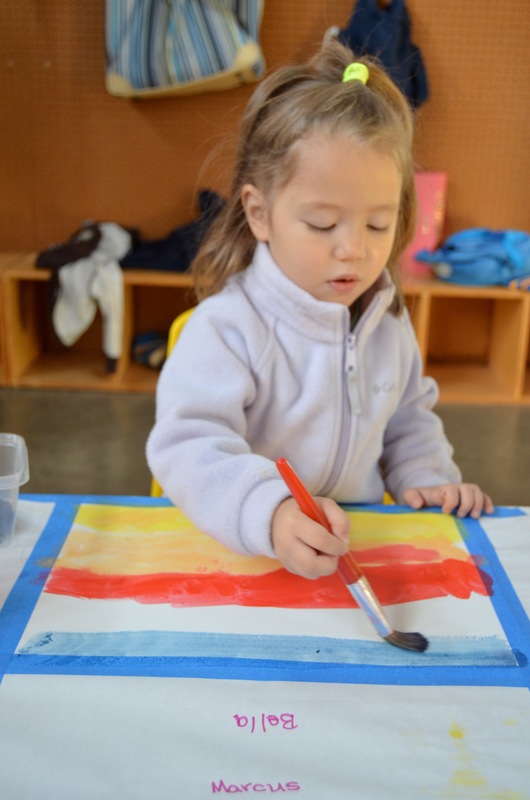 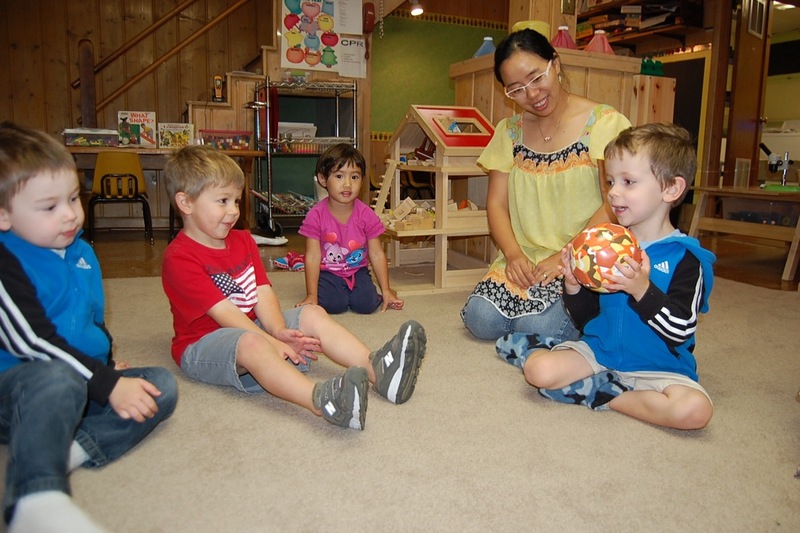 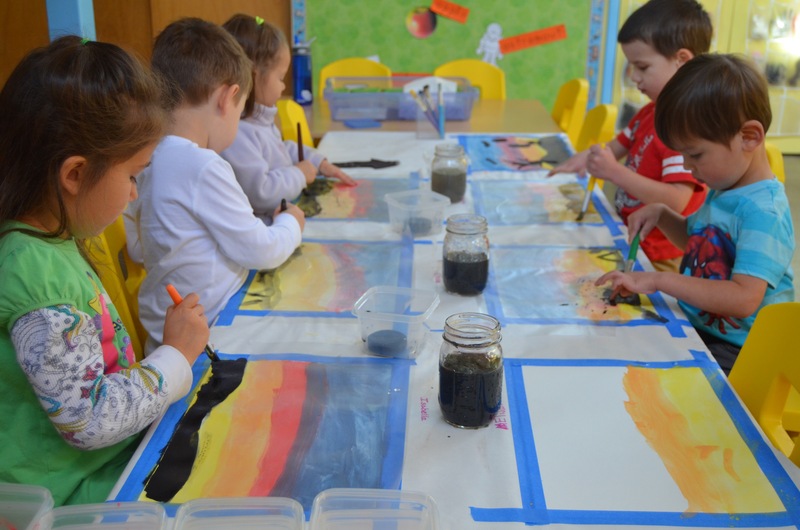 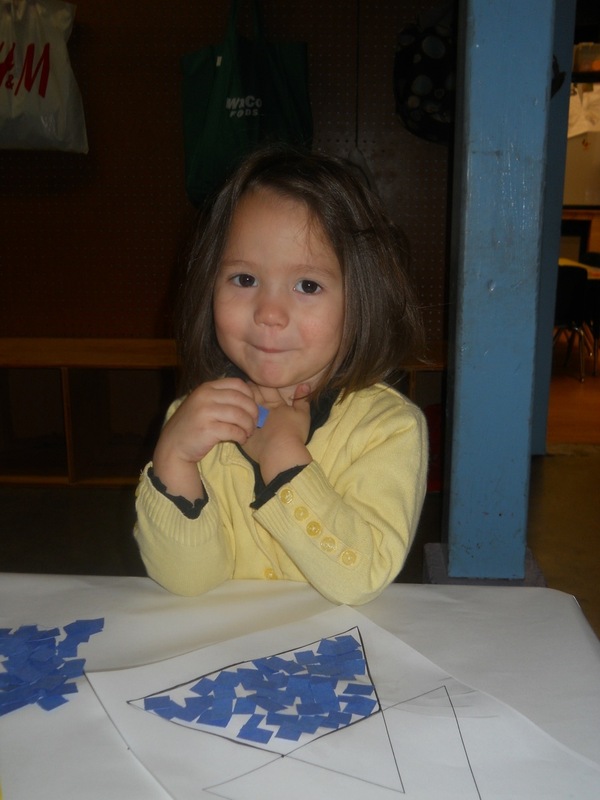 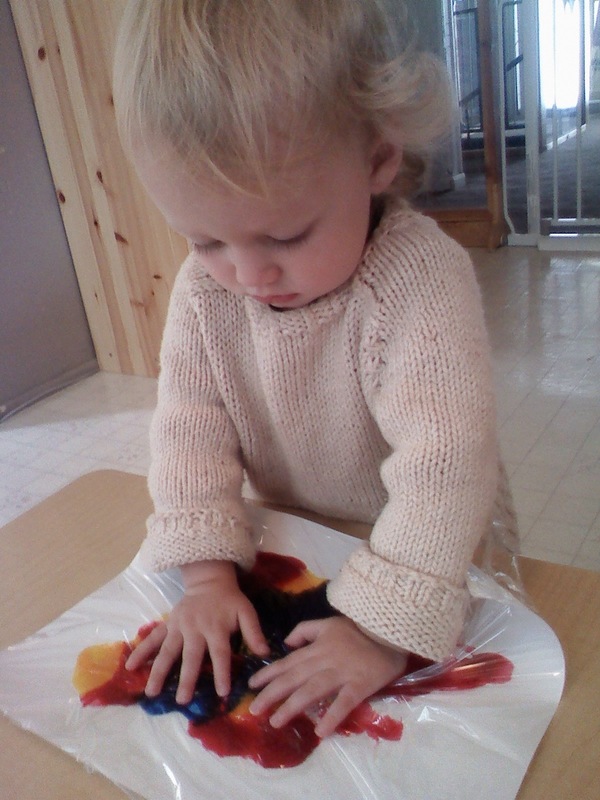 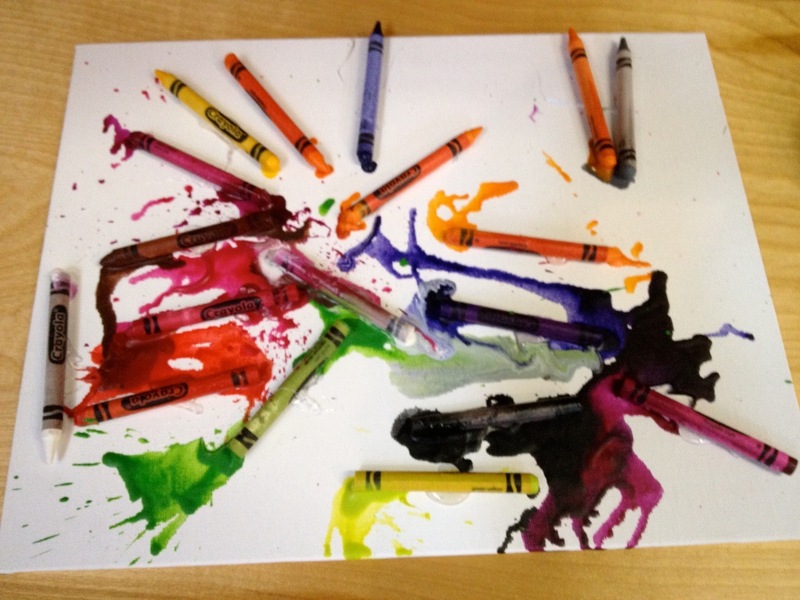 Last Wednesday and Thursday the babies had a lot of fun doing some “No Mess Art.” The children were confused at first about why the paint was not on their hands… They would look at their hand and then at the paper. 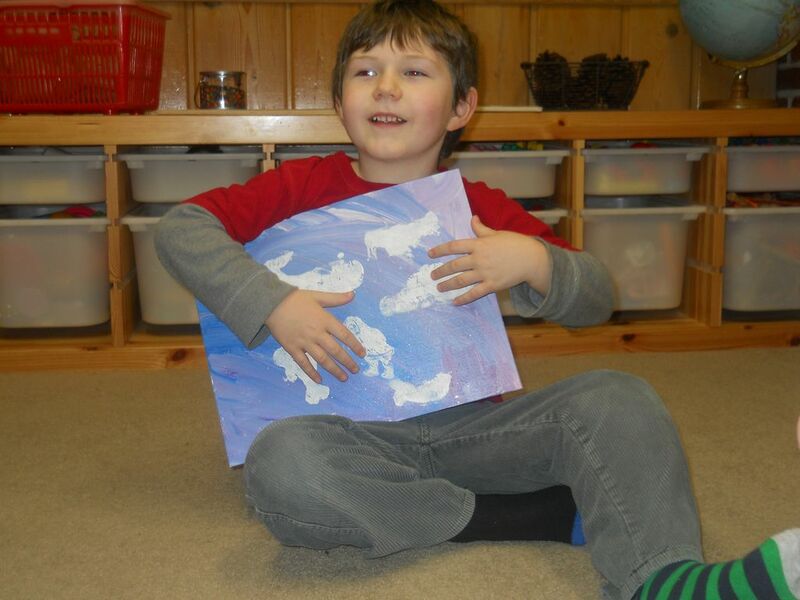 It was a lot of fun playing drums on our pictures as well! 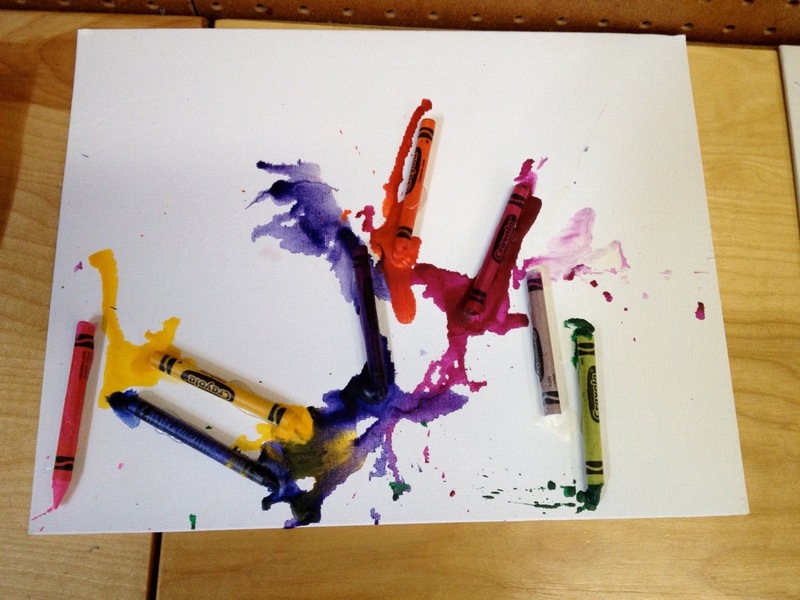 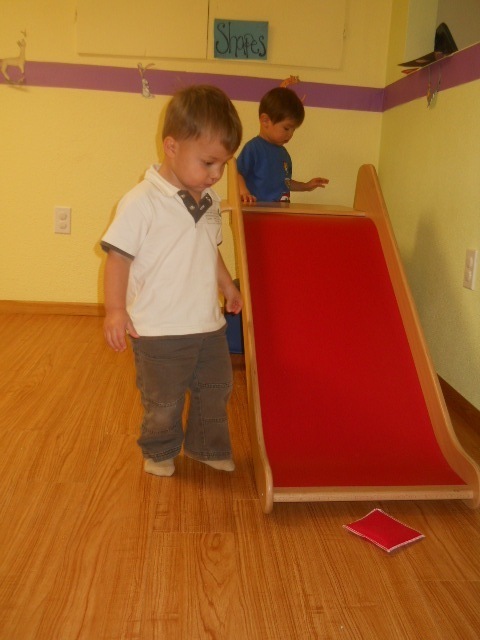 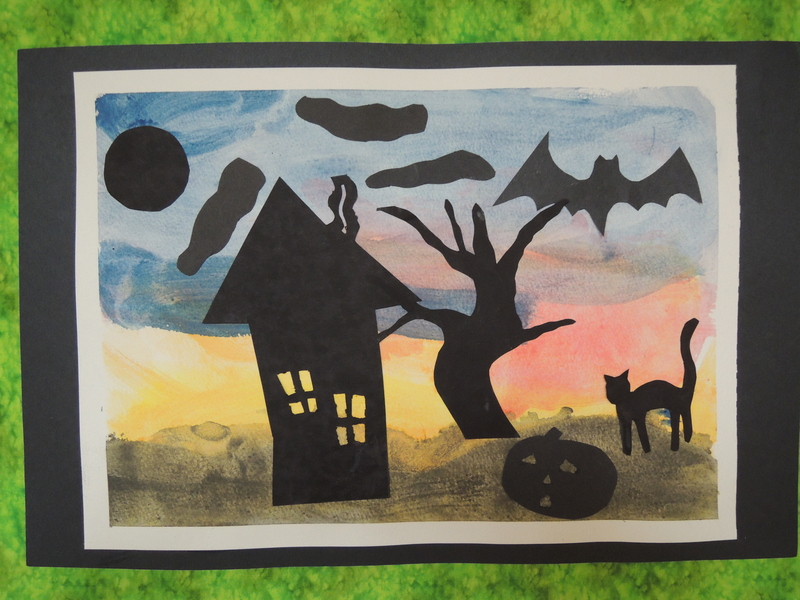 It’s a great project that you could easily do at home with your little ones as well. 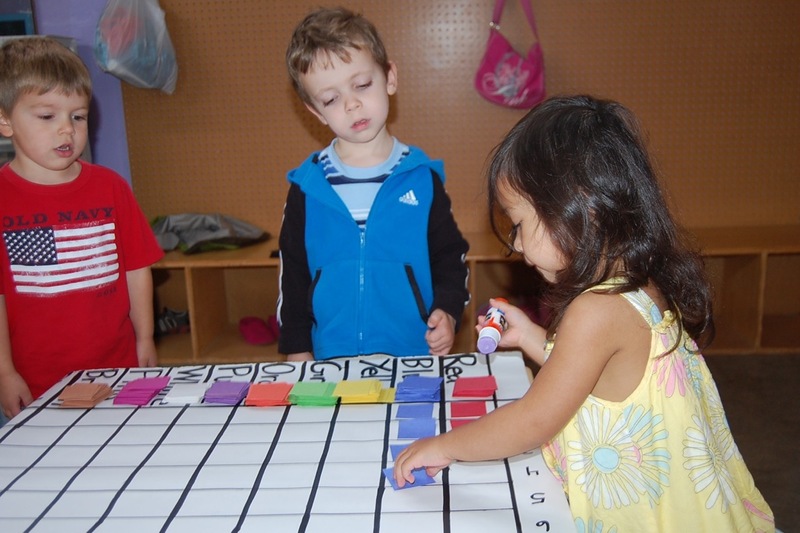 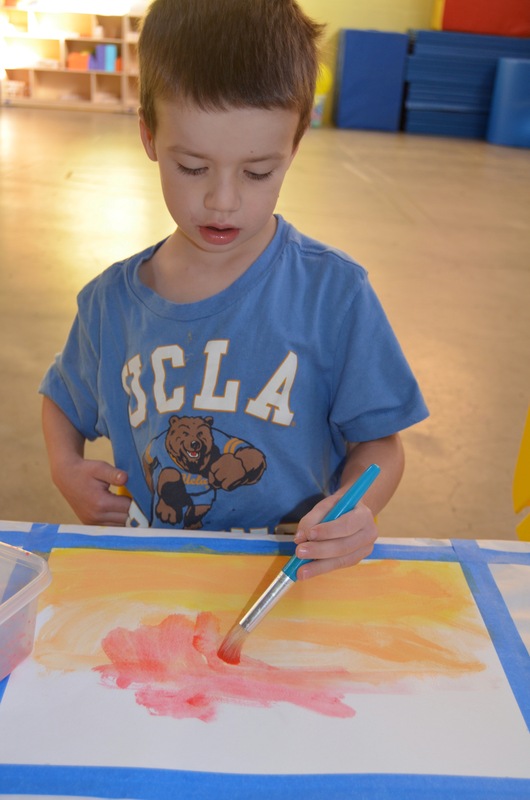 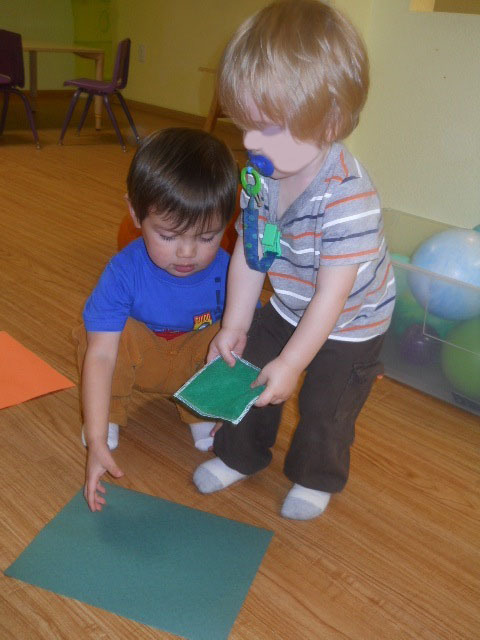 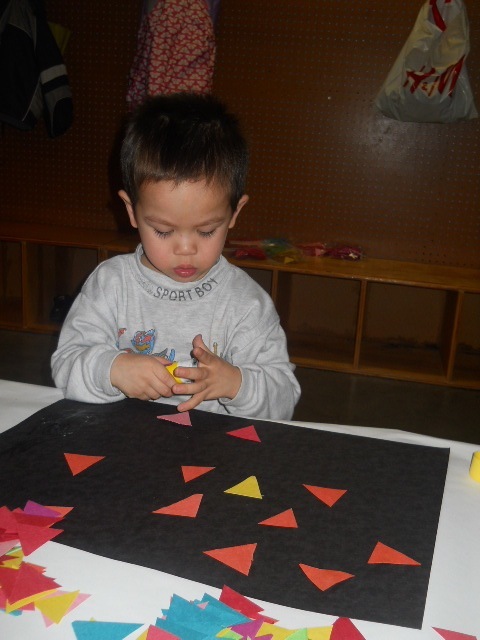 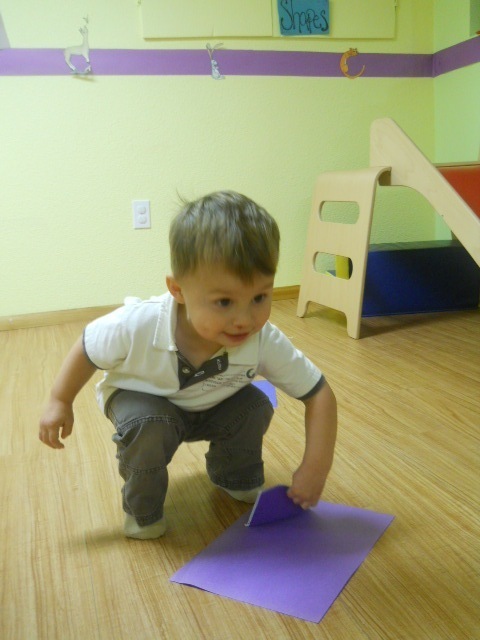 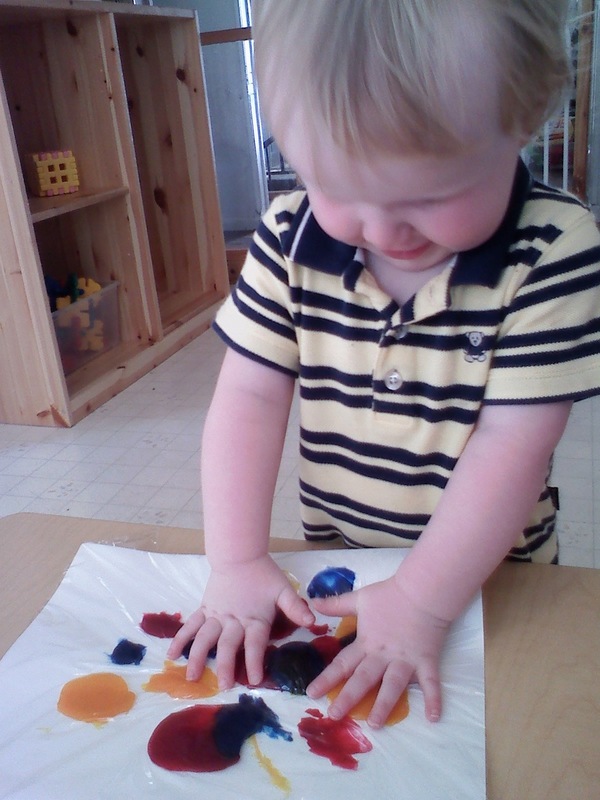 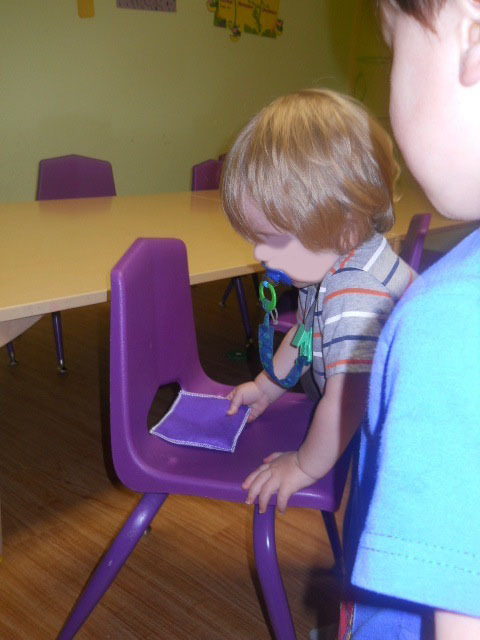 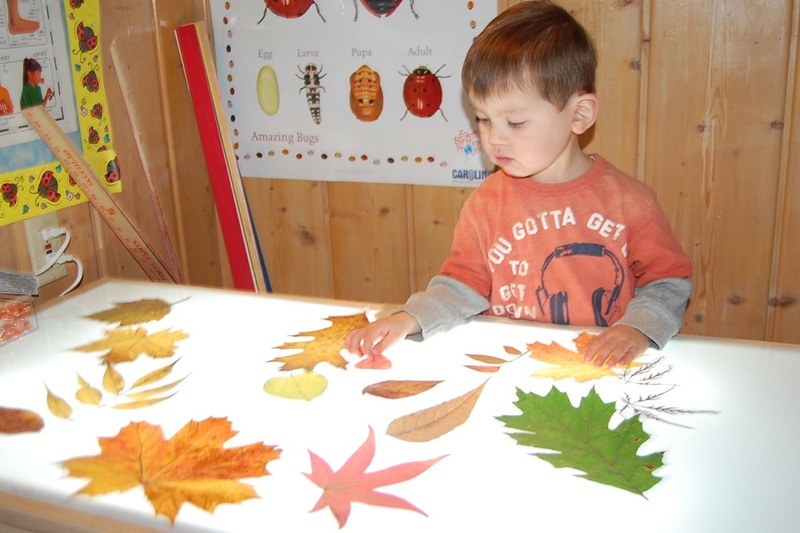 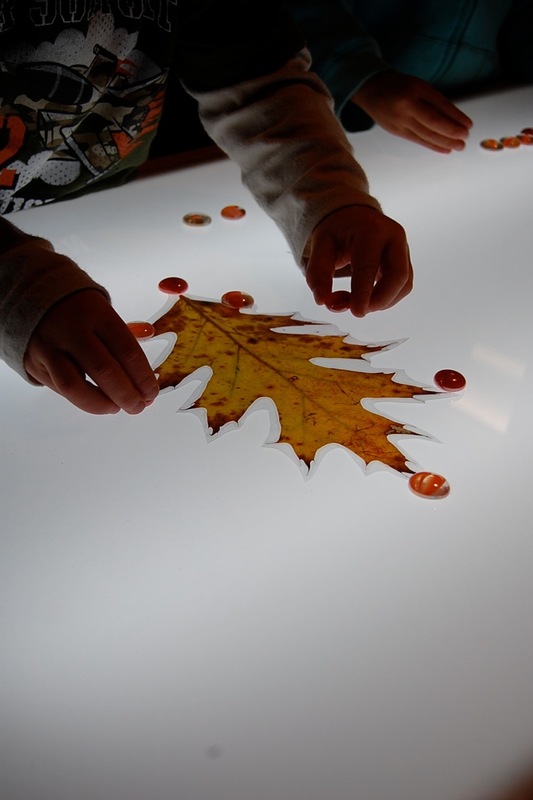 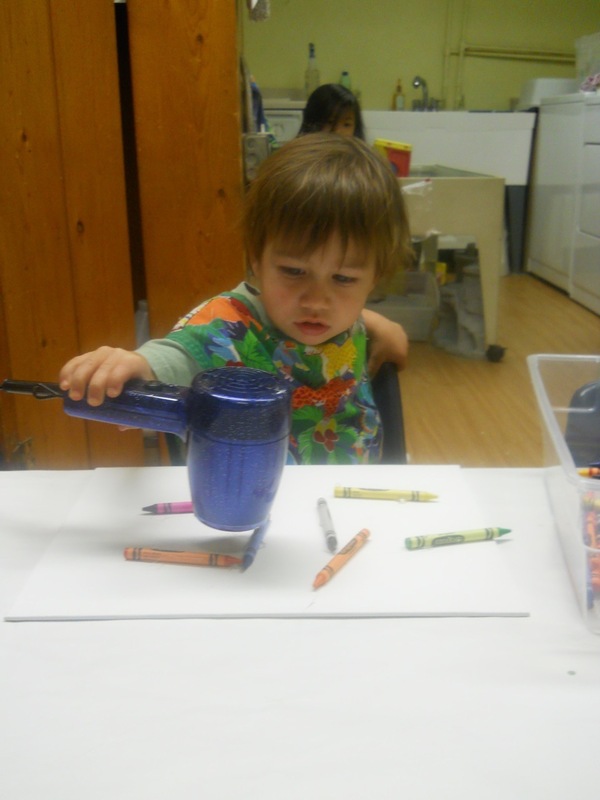 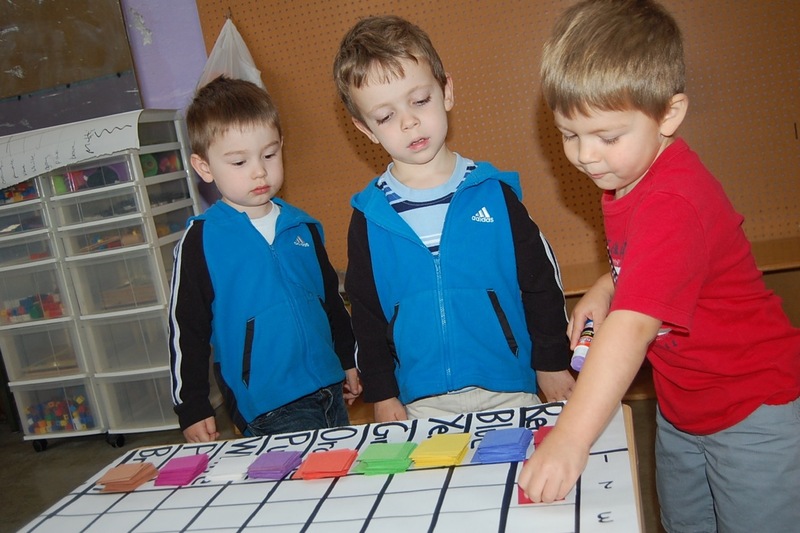 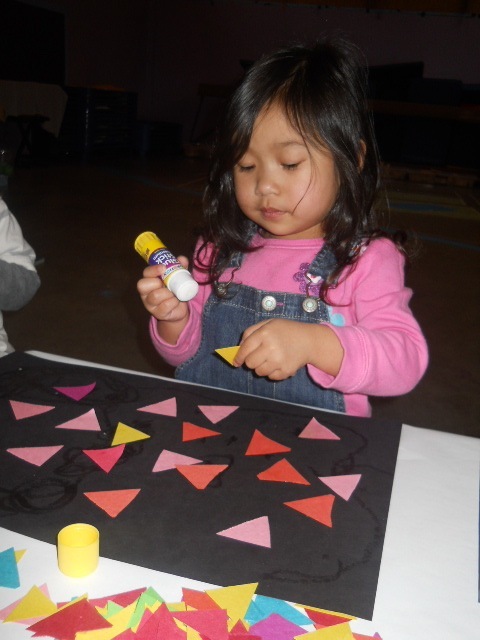 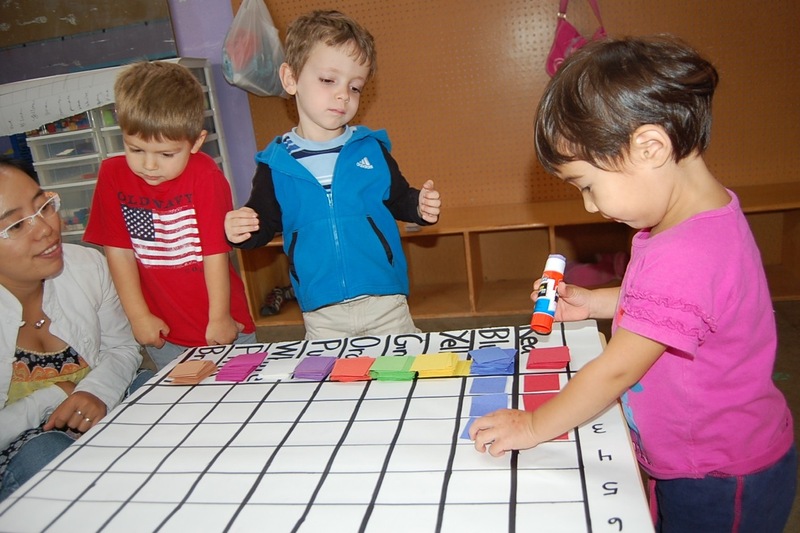 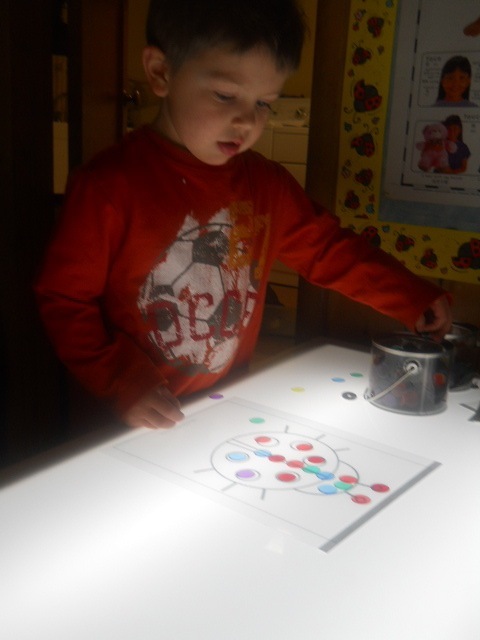 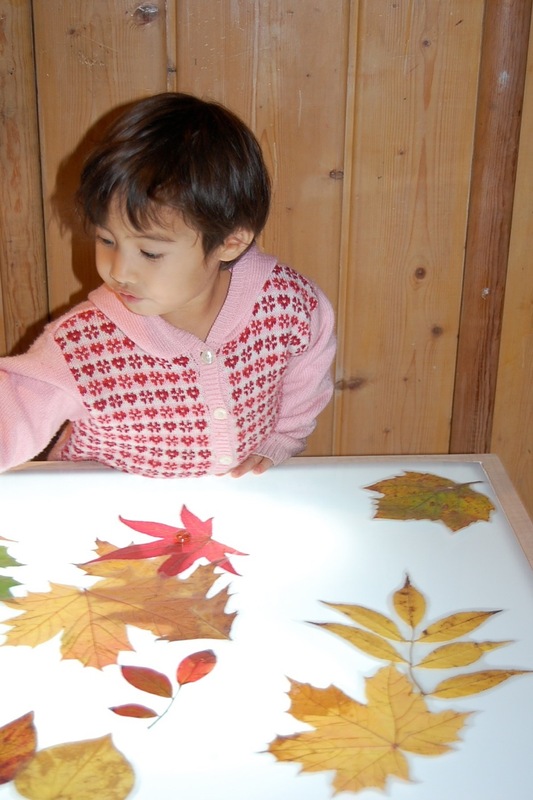 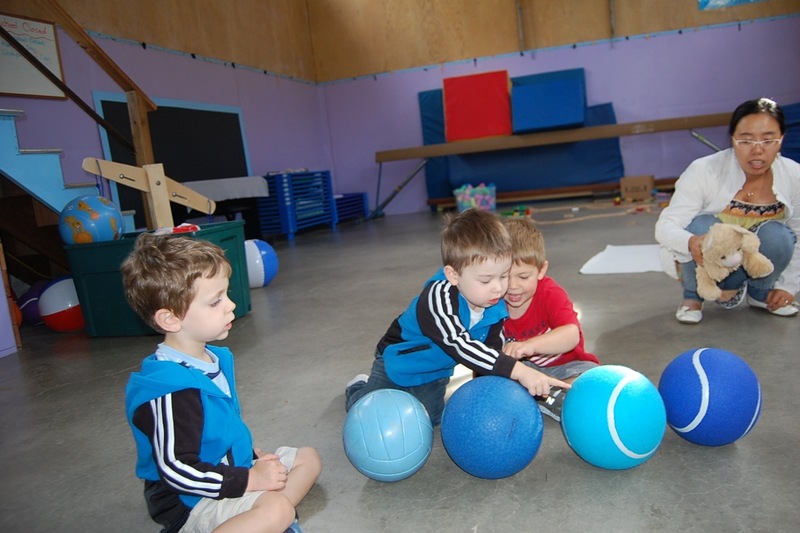 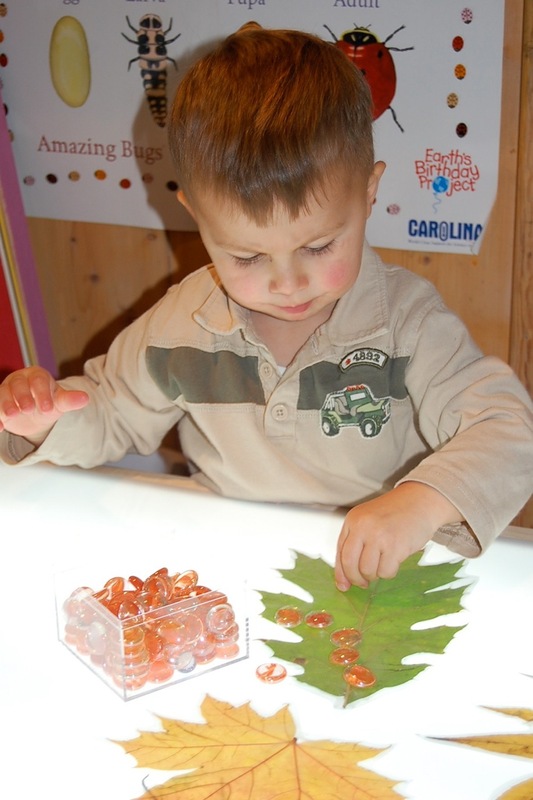 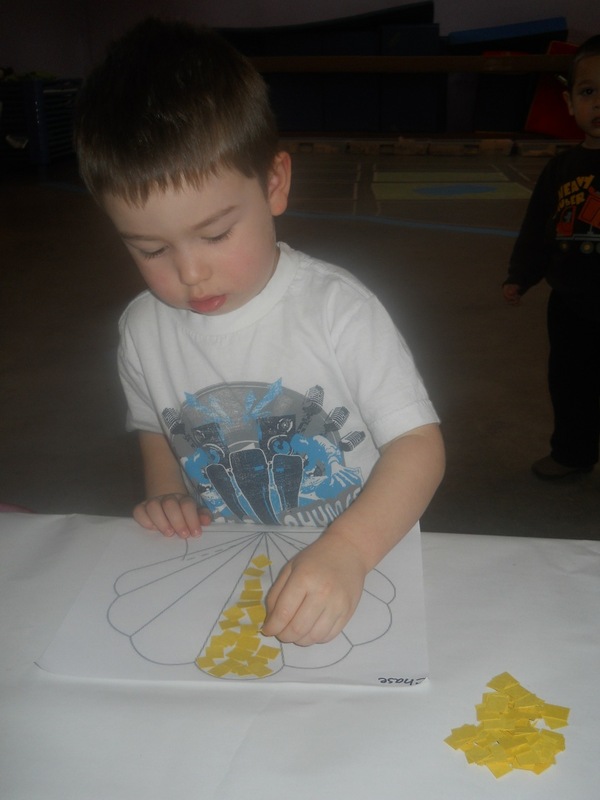 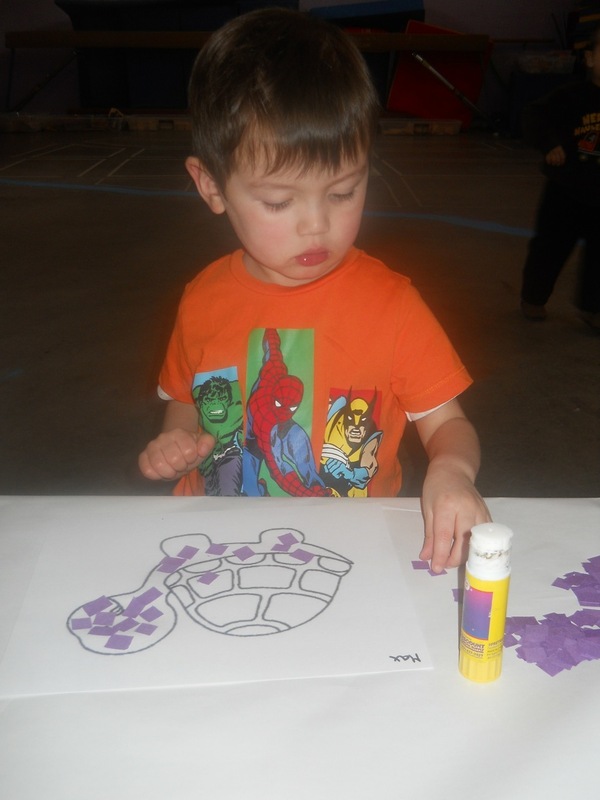 Pick paper of your choice, place globs of paint on the paper (use multiple colors), cover with plastic wrap, and allow your child to hit, push, and use their fingers to move the paint around. 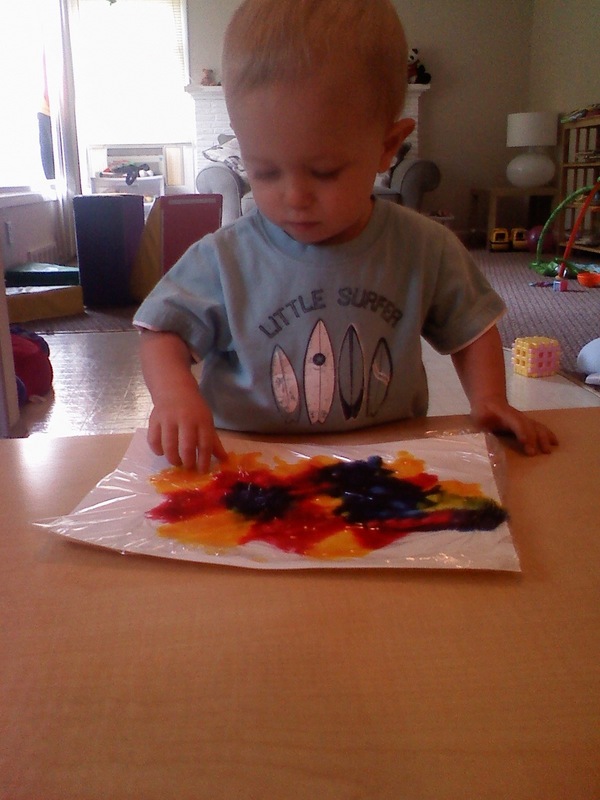 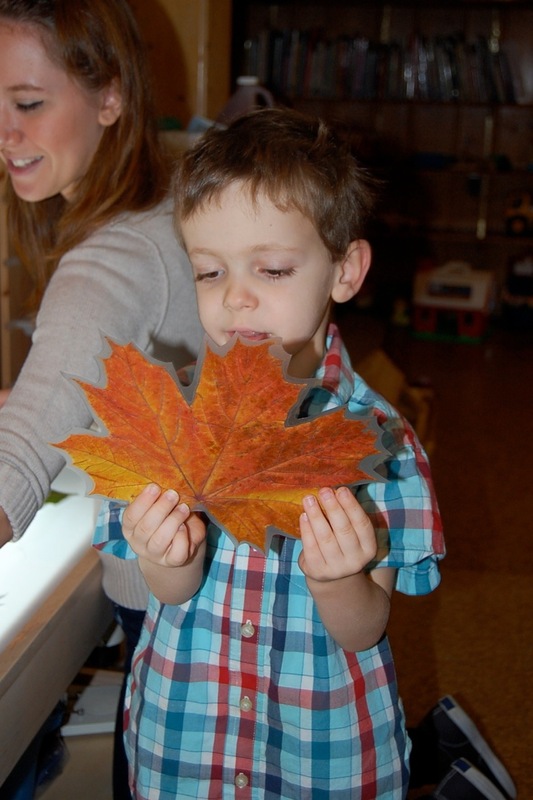 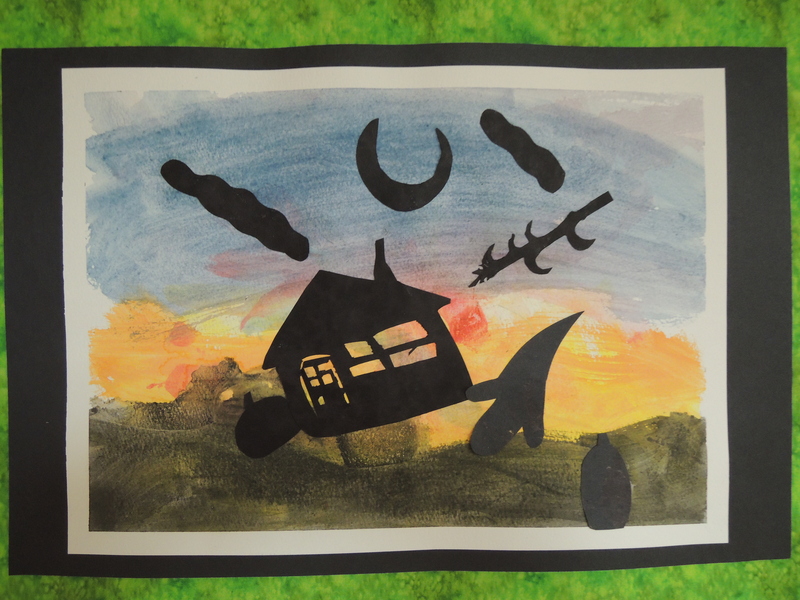 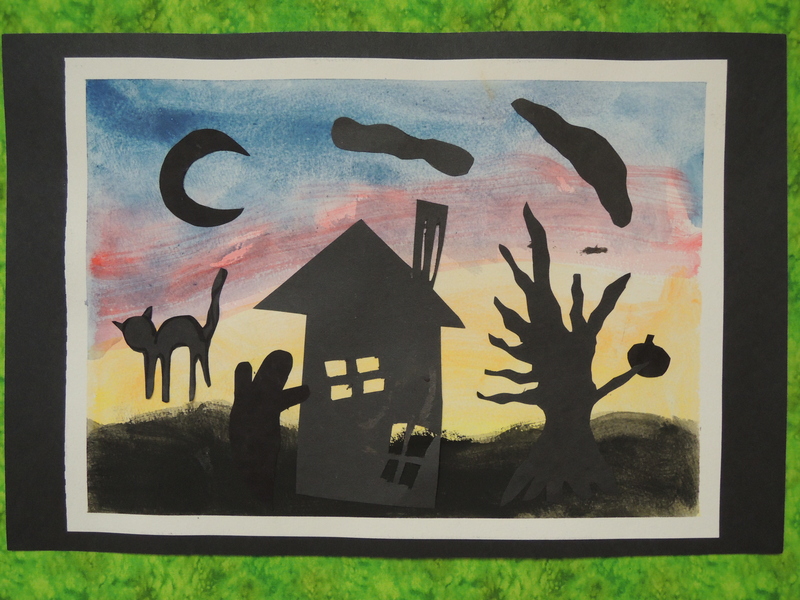 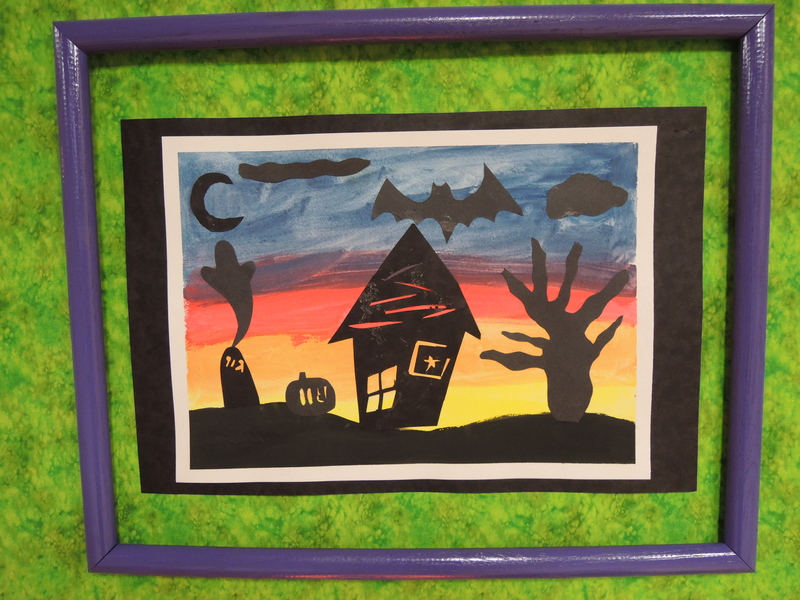 When child is finished, or the plastic wrap is beginning to come off, compliment your child’s beautiful art, remove plastic wrap (discard), and hang the picture to dry!